There’s a palpable sense of adventure in the air at Belle Vue. Maybe it’s the longer days, perhaps the post-marathon delirium setting in or possibly the return of the Tour of Tameside that made the previously (to this Belle Vue Racer at least) ridiculous prospect of running 3 ‘undulating’ races on the bounce seem like a perfectly sound way of spending Friday evening and the weekend. 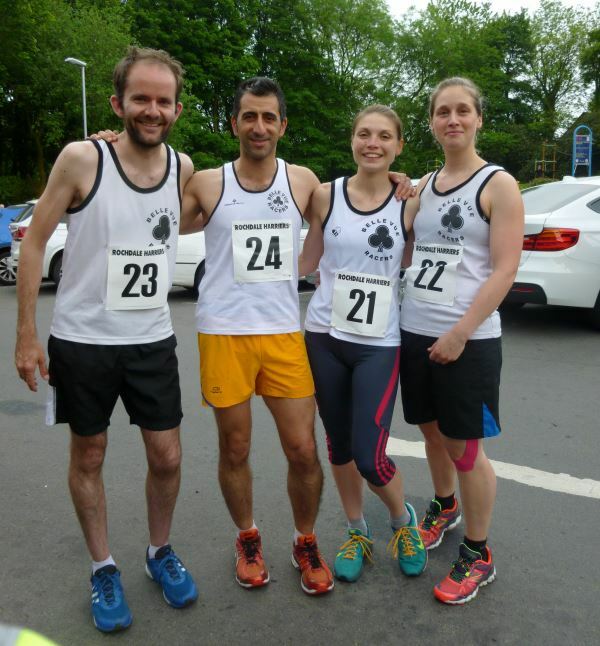 Vicky, Phoebe, Ali and Andrew took on the challenge of the Rochdale Three Day Event – 6 miles on the roads on Friday evening, 6 miles on the trails on Saturday morning and 6 miles up and over Knowl Hill on Sunday morning. The starter on the Friday had it spot on: tough as the Friday evening was, compared to Saturday’s looping trail race, it seemed in hindsight like a soothing warm up. On Sunday, the four 3-Day-Eventers were joined by Catherine, Cecilia, Julia and Phil for the Fell Race to round off a fantastic weekend of running in style. Particular congratulations to Phoebe who completed the three days in fourth position in the women’s race, covering the 18 or so miles in 2:38:11, only 3:58 behind third spot.